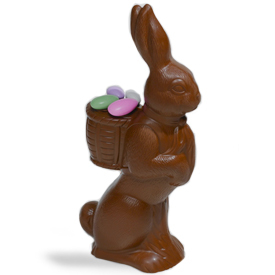 Standing over nine inches tall, this intricately detailed Easter Bunny is one and a half pounds of solid Swiss milk chocolate. Four colorful chocolate jordan almonds are nestled in this bunny's basket. Wrapped in cellophane and decorated with a lavender bow, this bunny is sure to be the centerpiece of any Easter Basket or Easter dinner table.